My wife and I revisited the Camper Creek watershed that we went to a month ago. We had it in mind to see if we could find the trail down to Camper Creek, near the park boundary. So we set of on Thursday afternoon and arrived at our campsite around 3 pm. Funny thing about my stitched panoramas, the centre portion of the pic ends up narrower than it appears in real life. 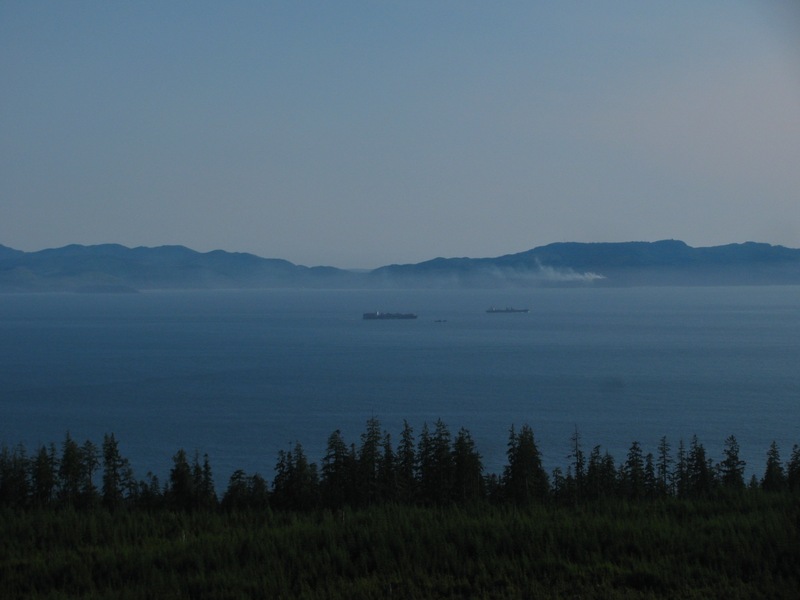 A bit of fog on Juan de Fuca strait, Neah Bay is over there on the other side, close to the middle of the picture and some smoke from (I think) slash burning up the hillside to the right of Neah Bay. Cap Flattery to the far right. This fog evaporated as the afternoon wore on and we could see some of the marine traffic in the strait. 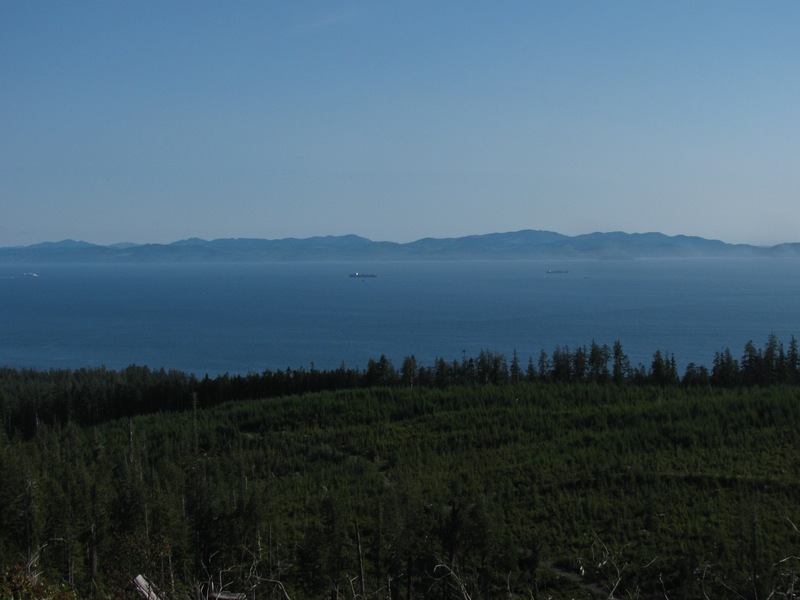 Neah Bay is behind the leftmost ship. I’m guessing you get the idea that we didn’t do much once we got to the campsite, not much except sip cocktails, look out over the strait, and read mystery novels. Oh and then before you know it, it was dinner time. 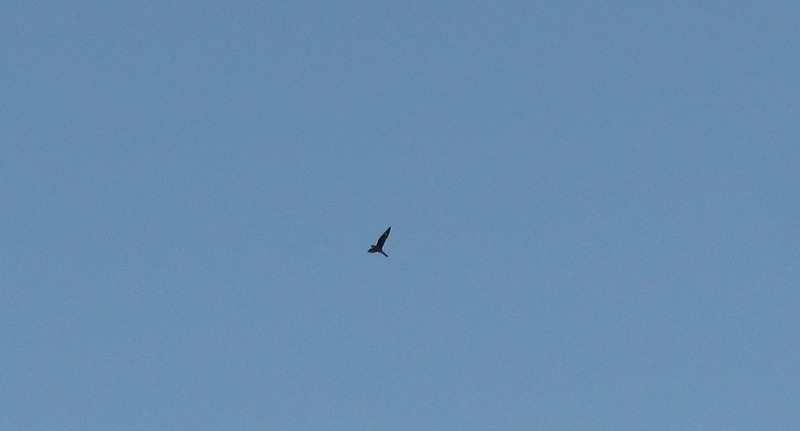 And three Nighthawks appeared, diving and buzzing. Very hard to get a picture of them. 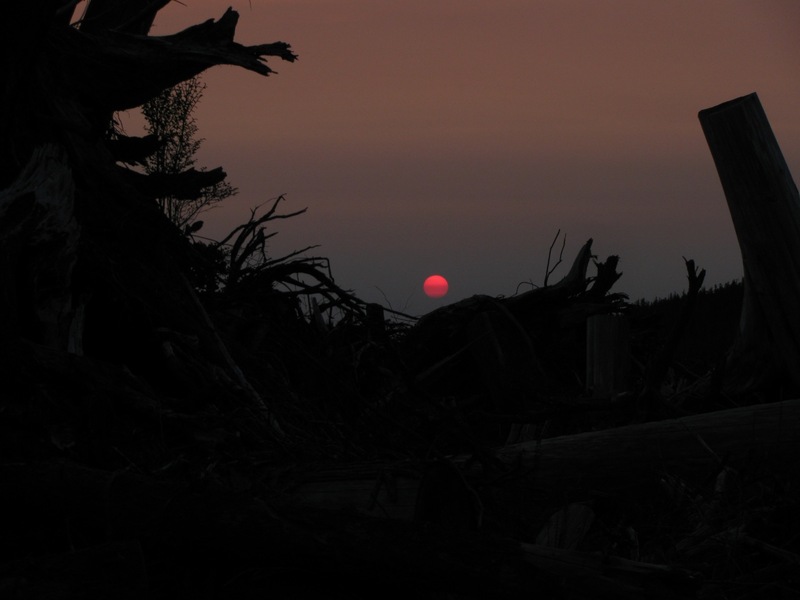 A bit of an apocalyptic sunset. Next morning the fog was back. I took us half the day to pry our selves out of the chairs and stop reading long enough to do some exploring. We found what we think is the trial down to Camper Creek, but the dogs were acting excited and we decided not to go down it for fear of running into something that the dogs would chase. 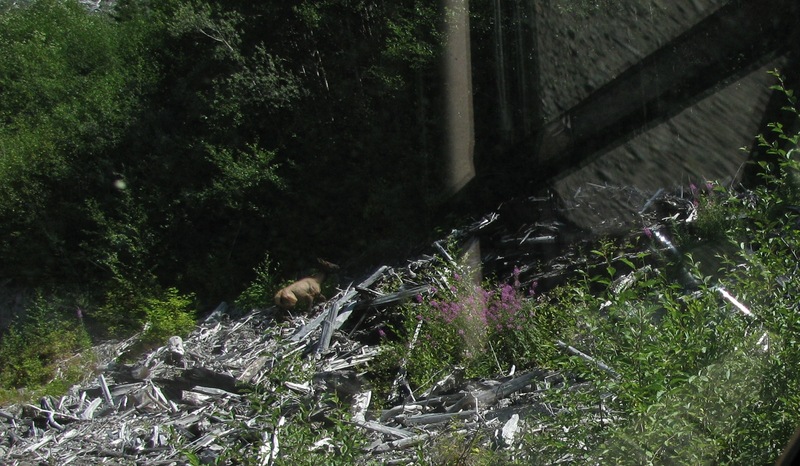 There are lots of bears around this area, no shortage of bear poop, and our dogs have a history of going after them. So we decided to drive as far northwest as the logging roads would allow, heading to where Walbran/Carmanah Park “T’s” into Pacific Rim National park. 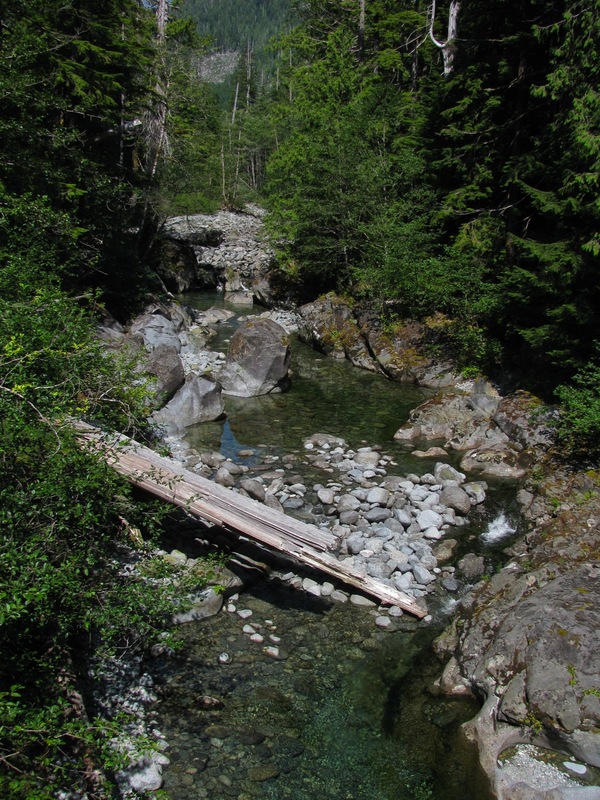 It is a logged area between Cullite Creek to the north, and Sandstone Creek to the south. 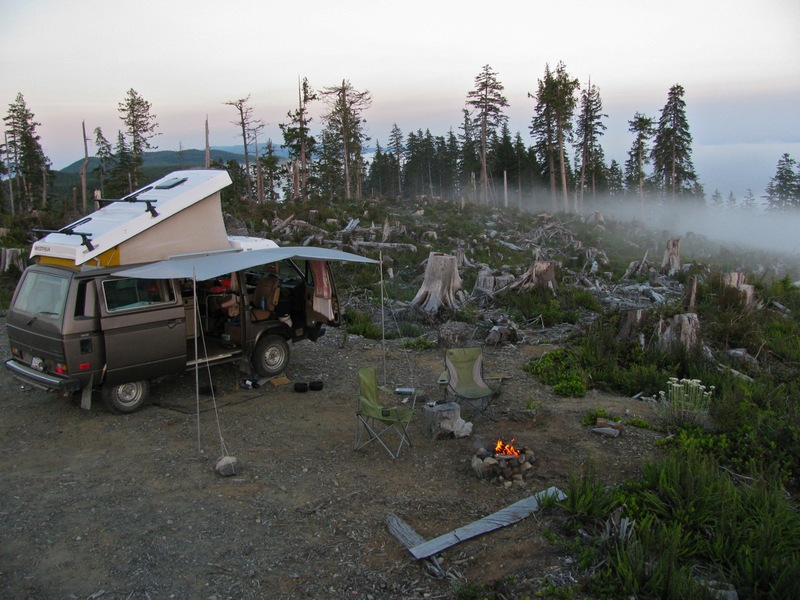 Interesting area but no great campsites so back we headed to the original spot. 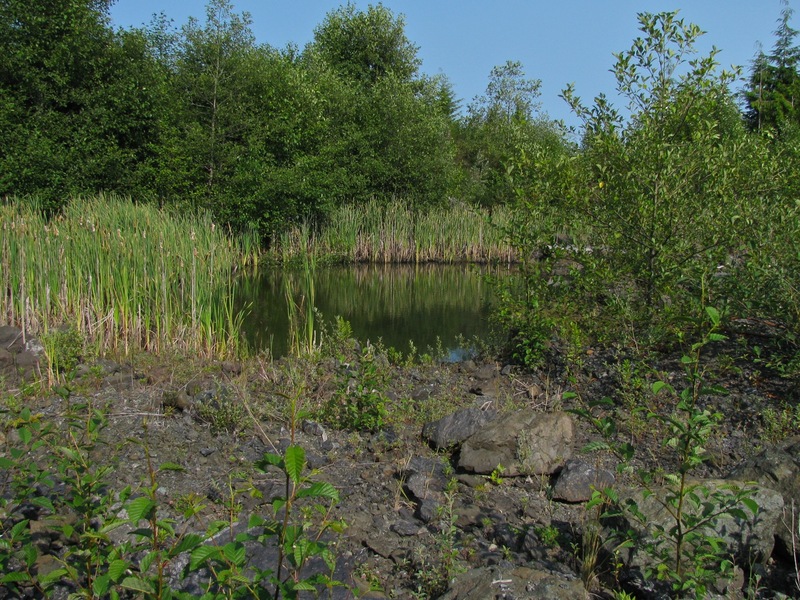 On the way back we had a dip in a nice pond in a gravel pit (often find blasted areas at the side of the roads. The rock used for logging road construction). I’d give this pit 4 out of 5 stars. Back to the book. I was reading “Voices” by Arnaldur Indridason. The fog never did lift form the straits that day. 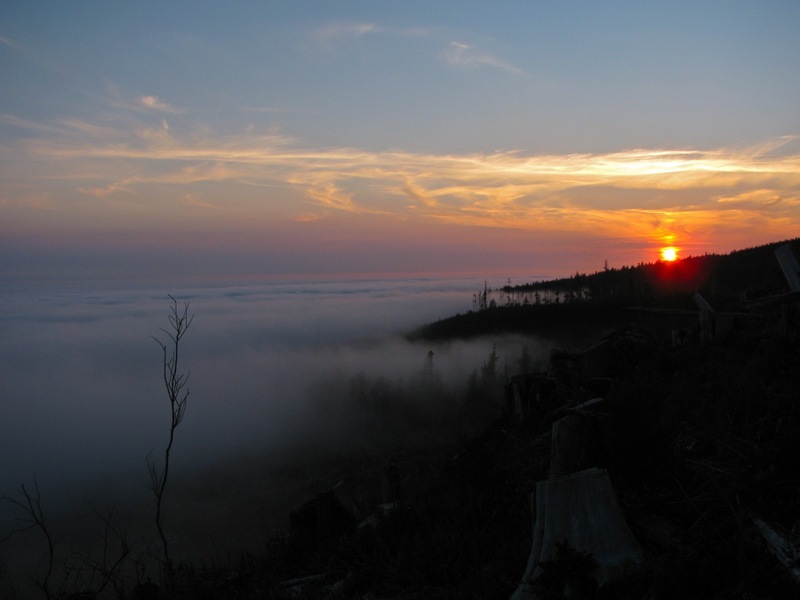 We wondered about the number of fog days Neah Bay must have. Here is a link with some weather data. Seems that Neah Bay has at least 14 days per month of fog. As the sun set, the fog crept up towards us. But then the wind changed to a land breeze and the fog was pushed back a little. Following morning was pretty darn nice. 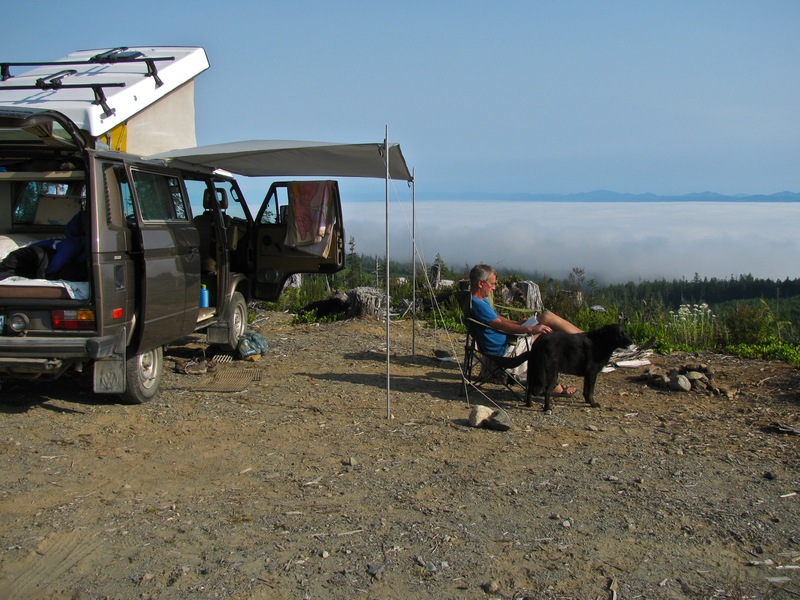 We packed up around noon and headed back out towards Port Renfrew. 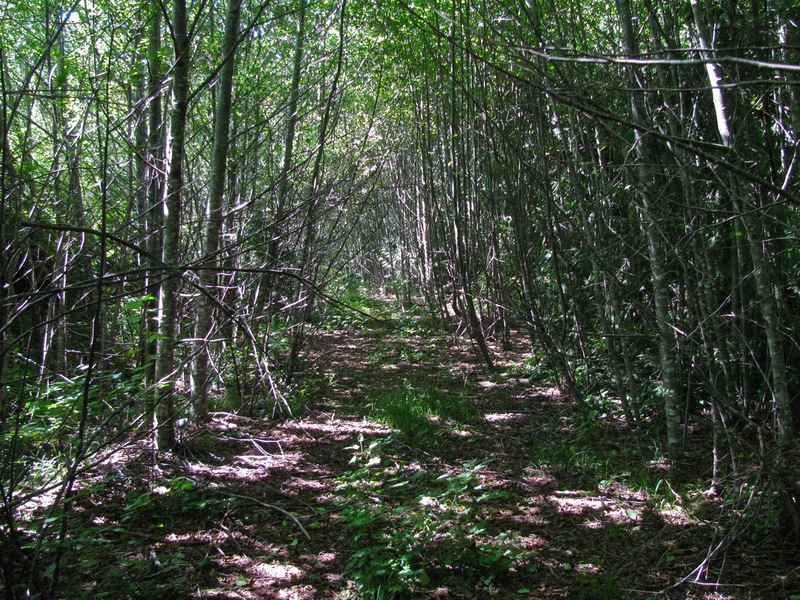 We did explore some logging spurs, nothing much to report except to say that expect some bugs when going down dank, alder lined roads like this. There was one productive side trip, up Braden main a few kilometres. A couple of female elk trotted across the road, finding and fumbling with camera got me this “Bigfoot spotted in PNW” class picture. Then we found a nice spot where a bridge crosses Braden Creek. We had a dip in the (cold) water then headed home. The van ran fine throughout the trip, but I’m really starting to get tired of the front springs – I still have the originals (tin top) on, and they are just not up to the task of supporting a westy conversion. I’d like a little more lift up front and I had been thinking about spring spacers, but now I’m wondering if those 2wd westy springs I have might be worth a try. I’ll need to look over the spring data again. 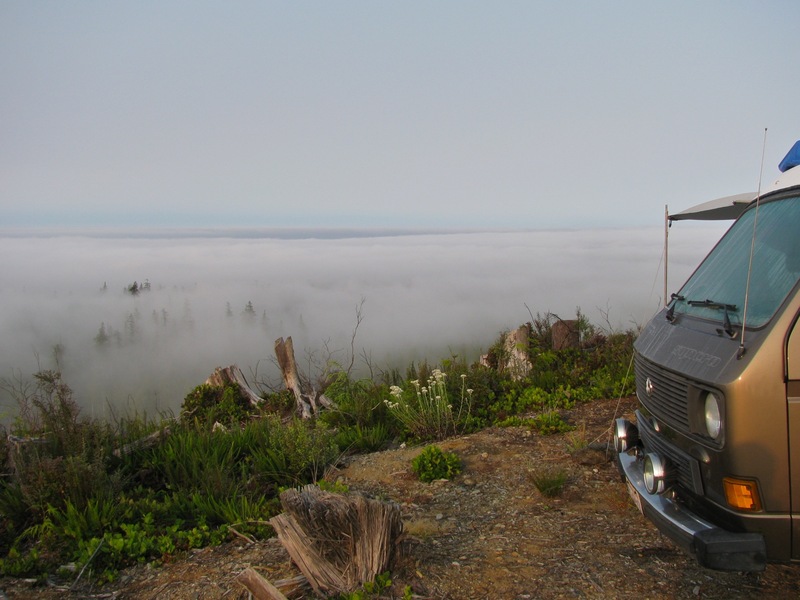 This entry was posted on August 12, 2012, 1:33 pm and is filed under syncro, trips, vanagon. You can follow any responses to this entry through RSS 2.0. You can leave a response, or trackback from your own site. Fog… I spent 3 years in Port Angeles and I’d swear that after 2 days of fog or rain/drizzle you got a Monday. Judging from the fine country you were in you have better weekends than I did! . 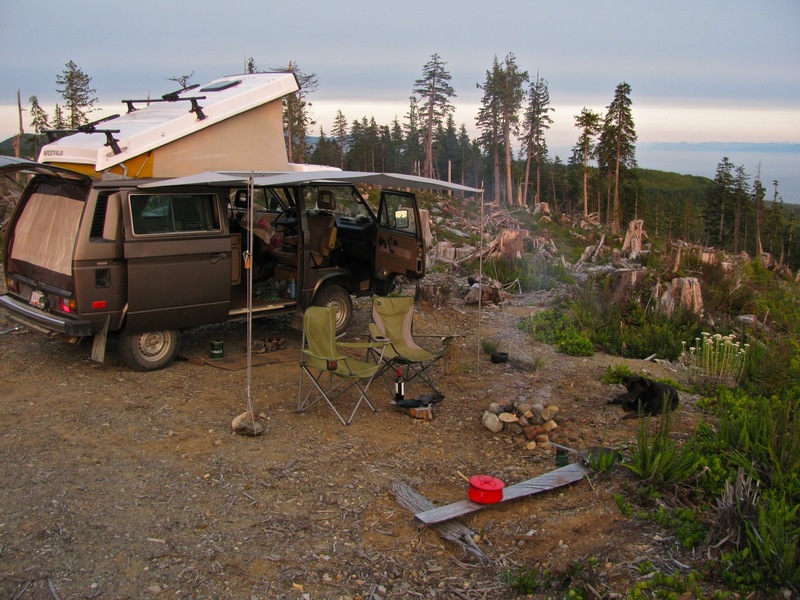 Nicely documenting your exploratory Vanagon adventures. Super job and thanks for sharing Alistair. Cheers! How do you get out to the island? And is the island inhabited with towns and civilization or is it all national park with logging sites? 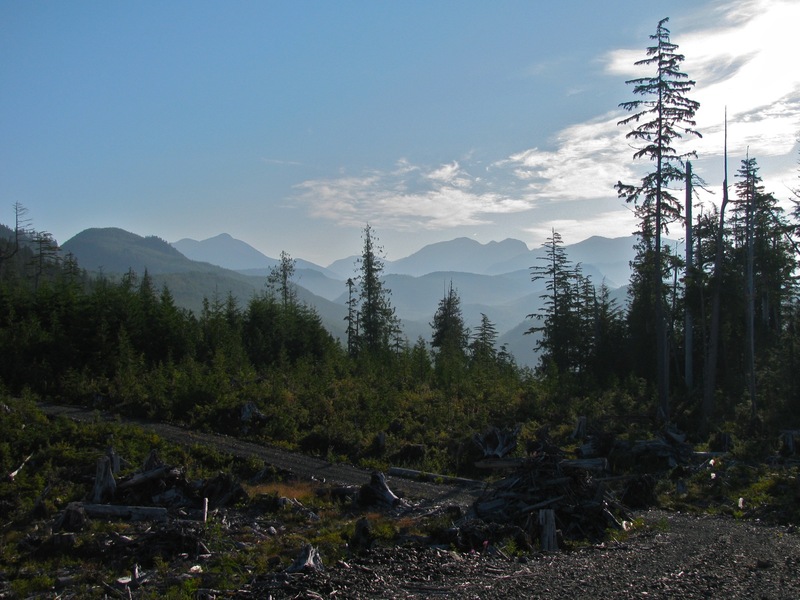 Is there a replanting plan in place by the logging companies? Vancouver island is a pretty big island and populated. Most of the towns are on the east coast and southern tip of island, I live about 25 km north of the largest town/city (Victoria) that is on the very southern tip. The island has been heavily logged over the last 150 years and I’m guessing that any large areas of virgin are now only found in parks and eco reserves. 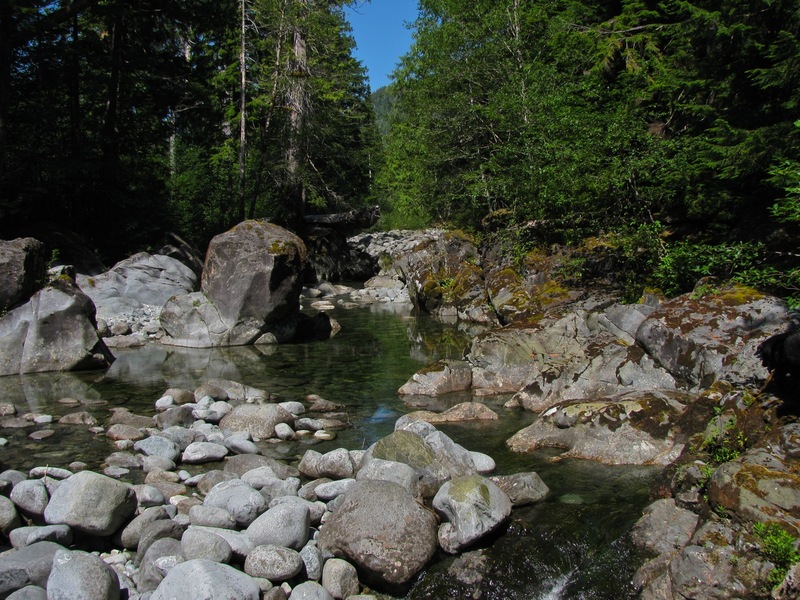 But you can find smaller patches of original forest even in logged areas – along streams and some steep hillsides for example. My wife and i joke about our recent habit of camping in logged areas. One one hand you do get great views and plenty of firewood, on the other hand it is a logged area 🙂 Mind you the logged areas do support quite a bit of wildlife, bears, deer, elk, wolf, various birds. I think it can be very productive for some animals as long as they have some areas of forest to provide cover, especially for over wintering. Yes, it does help, Alistair. It is very kind of you to take the time to ‘paint the picture’ of the scene there on your island home. It is all very interesting. Again, thanks for your insights and sharing.